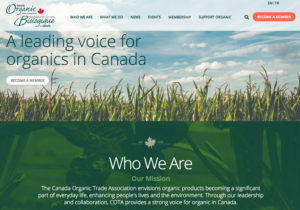 The Canada Organic Trade Association wants the federal government to establish permanent core funding for periodic reviews of the national standard. Ottawa has contributed $542,555 for the review now underway, which will be completed in 2020. However, securing that funding took a long time, and the federal government has indicated that it believes industry should be paying for the future reviews that take place every five years, said COTA executive director Tia Loftsgard. “There is just this misperception that it is still a private industry standard, and they don’t want to set precedents so other private standards would come to them for funding,” she said. Loftsgard said the government owns the standard and is responsible for keeping laws up-to-date. “It is not the responsibility of industry to fund something that is a Standards Council of Canada process,” she said. COTA has support from all the federal political parties on its stance, and the House of Commons agriculture committee has recommended twice that the government should foot the bill. That is what happens in the United States and the European Union. “We will not be a competitive nation if the government starts pulling out on some of the most fundamental, critical parts of ensuring that we’ve got integrity in organics, which is by keeping the standards up-to-date,” said Loftsgard. She hopes the issue will be addressed in the 2019 federal budget. COTA would also like Ottawa to establish public directories listing who is organically certified and to have Statistics Canada start collecting export sales and acreage data. “These sorts of things are a government responsibility,” said Loftsgard. She said organics is no longer a niche market. It accounted for 2.6 percent of Canadian grocery sales for food and beverages in 2017, up from 1.7 percent in 2012, according to a state of organics report prepared by COTA. COTA also wants all provinces to create organic regulations. Six of the 10 now have them in place. Among those without provincial regulations are Ontario, the biggest consumer of organic goods, and Saskatchewan, the largest producer of organic products. “Those two markets are glaringly missing from having their own provincial regulations,” she said. Federal regulations apply to products that are exported, sold across provincial borders or that carry the Canada Organic logo. However, they do not apply to products grown and sold as organic within the same province that do not carry the Canada Organic logo, which creates a loophole for possible fraudulent activity. “There is no enforcement agency that can stop you from saying that your organic when you’re not,” said Loftsgard.